Before you jump into bunch of yoga mat reviews, you should learn what makes a yoga mat good or bad. Because people have different interests and needs, you should also figure out what makes a mat good for your specific needs. Let’s look at important points to consider when looking for the best yoga mat. Some people have unlimited budgets. Some of us don’t. We’ll review our way through the different budget ranges. You can get a solid yoga mat for about $15-20. That said, not all $20 yoga mats are equal. The random yoga mat from Walmart or Target might start falling apart after a while. It will also absorb liquids and breed bacteria. Plus, it will be slippery, constantly roll up on you, and not perform well. So if you want a low-cost yoga mat, make sure you get the right one. Keep in mind, though, that cost also involves durability. If you need to replace your cheap mat every 6 months, the true cost is much higher than simply buying a premium yoga mat that lasts for years. Are you a beginner or experienced yogi? Beginners might want to buy a lower cost yoga mat. If you are on a budget, there’s no need to get an expensive mat and find out you don’t like yoga. It’s not like you can resell used yoga mats (yuck!). In this budget range, we like to recommend the Clever Yoga Better Grip. It has solid all-around performance and comes with a lifetime warranty for less than $20 on Amazon. You can read our full review on it by clicking here, or browse through or other yoga mat reviews in the “popular” category. Starting from around $30-60, you have a lot more options. Most yoga mats in this range from reputable brands are decent. If you have pet peeves, make sure to read the reviews for personal preferences, like mats that are extra heavy or harder to wash and so on. Most of the mats in this range are not technically superior to the best $20 mats. But they do come with slight extra features, and in particular, beautiful designs and prints. You are starting to pay for fashion a bit more than function in this range. That’s okay! Yoga should be fun, and picking a yoga mat can be fun too. A good place to start is by browsing our review of pretty yoga mats. The upper end of this range starts to mix with the premium mat price range. 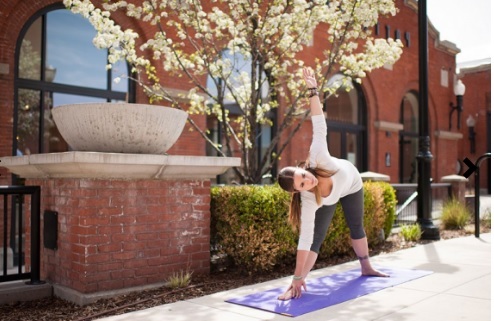 You might start to see some name brands you recognize, like Nike or Lululemon, but we usually recommend other yoga specialty brands for their superior quality and value. Premium yoga mats can go from around $70-100+. Mats in this range are usually made from natural rubber and have excellent surface gripping properties. While there are some specialty mats, such as extra large or extra thick ones, if you are looking for the best mat that money can buy, there are a few standard recommendations. The Manduka PRO Mat, which we review here, is a classic premium bestseller. This is the most famous yoga mat, the Porsche or Ferrari of yoga mats. It is probably the most expensive yoga mat you can buy as well at $100 or more, depending on the particular size and color. The Manduka is thick and heavy, which can make carrying it to class a bit more difficult, but it is a definitely a solid choice. If you are looking for alternatives to the Manduka, we usually recommend the Clever Yoga LiquidBalance, which we review here. The LiquidBalance is lighter than the Manduka, but still provides excellent cushioning and support. In terms of grip, no other mat can match the LiquidBalance under the most difficult conditions. Even the Manduka gets a bit slippery without a towel in hot yoga conditions, where only the LiquidBalance can holds its own. You can browse our other premium yoga mat reviews from the “premium” category page. Yoga beginners or larger individuals often look for a thicker yoga mat to provide more cushion and support. We have an in-depth article on yoga mat thickness that you can read here. Just keep in mind that a cheap and thick material will not cushion you as well as a thinner but denser material. Also, a mat that is too thick will make yoga difficult and even cause extra wrist pain. Most standard yoga mats are about 4.5 mm, with extra thick ones going up to 6mm, and light travel mats being 3mm or thinner. Again, the material quality is as important as the thickness, so as long as you keep to the major yoga brands, you should be fine. If you absolutely want the thickest yoga mat that is still stable enough for yoga, the Manduka PRO Mat at 6mm is one of the thickest premium mats. Standard yoga mats are about 68″ long by 24″ wide, although there is slight variation from different brands. This size should be suitable for all poses for the average height. If you are on the taller side, you might want to look into an extra long model like the Kurma mat that goes out to 80 inches. The Manduka PRO we mentioned above also comes in longer, but more expensive, versions as well. If you want something huge, Manduka also makes a giant square version at 78″ by 78″. We review the Manduka PRO Squared here. Keep in mind that you won’t want to lug this around to your daily yoga class. This is more for keeping at home. 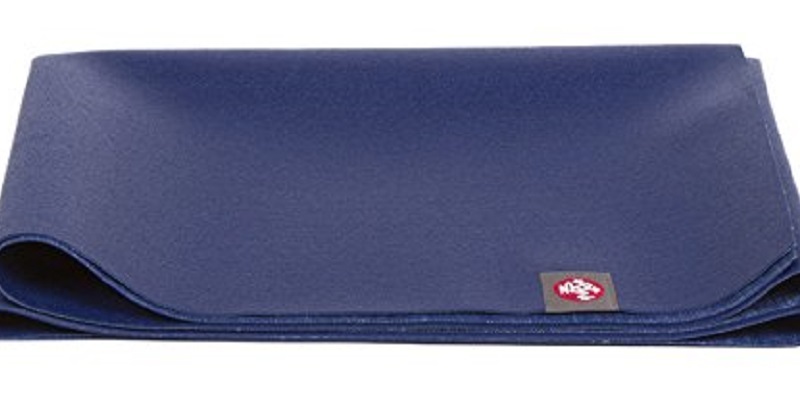 Speaking of traveling, if you want a mat that is very portable, nothing beats the Manduka EKO SuperLite. This mat folds up small enough to fit into a purse! Of course, the portability comes at the cost of thickness, as this mat is only 1.5 mm thick. 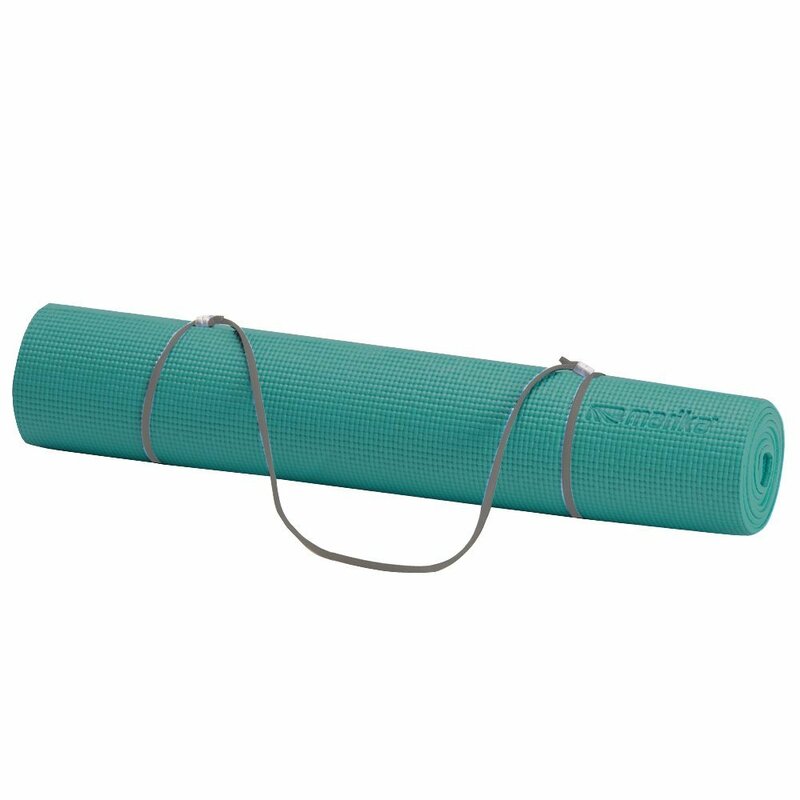 However, if you want the smallest yoga mat for traveling or special occasions, you might want to give this one a try. If you want to explore more foldable yoga mats, check out our review of the best foldable yoga mats. Low-end yoga mats often use open-cell foam material, but all the mats we recommend have closed-cell construction. Open-cell means that the foam is porous, and as a result, will absorb sweat and bacteria deep into the mat. This is unhygienic and also reduces the mat’s durability as the bacteria and sweat break down the mat material. The mat can also develop an unpleasant odor over time. A closed-cell foam does not absorb liquids deep into the mat. You simply have to wipe the top of the mat clean with a sanitizer or spray. You don’t have to worry about odors or getting a foot infection. Regardless of whether your mat is open or closed cell, you will need to properly clean your mat. We teach you how to clean you mat in this article. For open-cell mats, you will need to soak your mat or machine-wash (if compatible) to really get out the absorbed grime. For closed-cell mats, you can use one of the cheap simple yoga mat sprays that we cover here. Most premium mats will be made from natural rubber. Rubber has excellent cushioning and support, great durability, and is compatible with environmentally-friendly manufacturing. All the rubber yoga mats you find here will be closed-cell for easy cleaning. Rubber can be a bit heavier than some synthetic alternatives, but for the best performance, you can’t go wrong with natural rubber. The one downside to rubber is the smell of brand new mats that some people find offensive. However, if you air out your new mat and wipe it down regularly, the rubber odor should quickly go away. 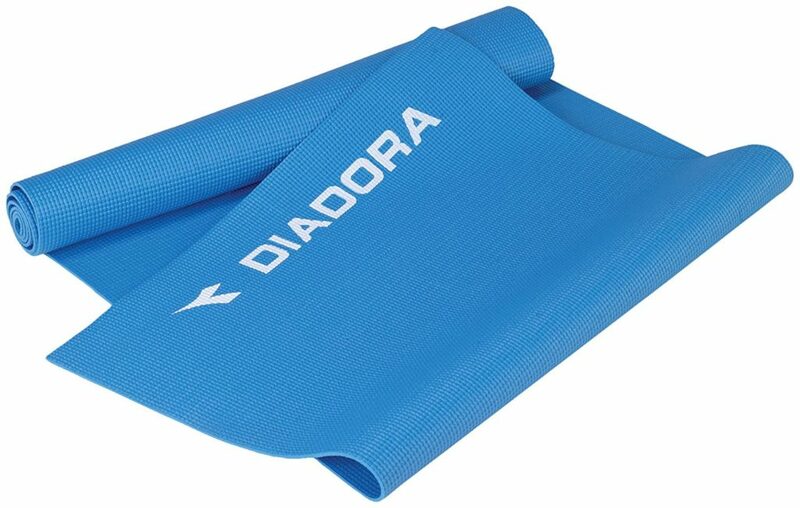 Low and mid-range yoga mats are usually made from PVC or other synthetics like TPE. These materials are lighter than rubber and still provide good cushioning. Make sure you look for a closed-cell version. While these materials are less environmentally friendly, eco-conscious brands like Clever Yoga make sure the manufacturing process has minimal emissions and waste. For your own safety, most reputable yoga brands will tell you upfront that they do not use toxic chemicals or dyes in the foam material. The PVC Kurma mat even has a certification that it uses medical grade PVC. 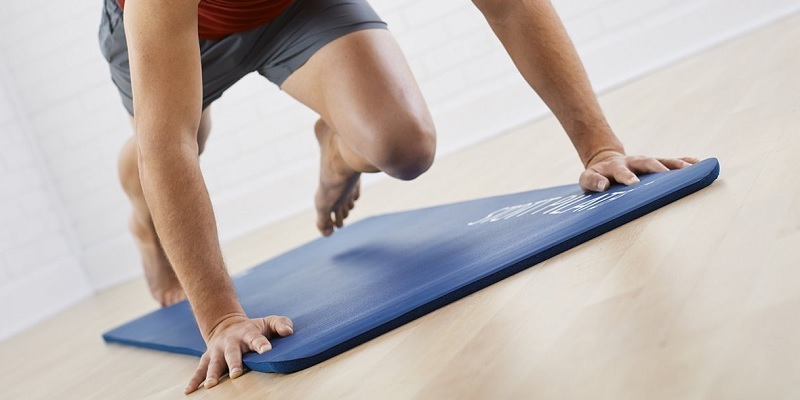 If you really want the best eco-friendly mat, stick with natural rubber or one of the other green brands mentioned here. A couple companies are starting to offer hybrid towel-mats, that have an upper microfiber suede upper layer bonded to a foam lower layer. This is similar to using a yoga towel on your yoga mat, but in one piece. An example of this is the Combo Yoga Mat. If you are interested in this alternative to traditional designs, you can give them a try. The Free Thirty Three Union yoga mats also use the same approach. From their yoga mat reviews, you’ll notice that these last two brands have some of the most gorgeous mat designs. That’s because it’s easier to print on the soft upper surface using safe, non-fading, water-based dyes. If you want good yoga mat fashion and a towel+mat combo, these mats are a good choice. Cheaper yoga mats tend to be very slippery. Not only is this dangerous, but an unstable surface makes it more difficult to perform yoga poses. The yoga mats we recommend here all have a decent sticky grip. 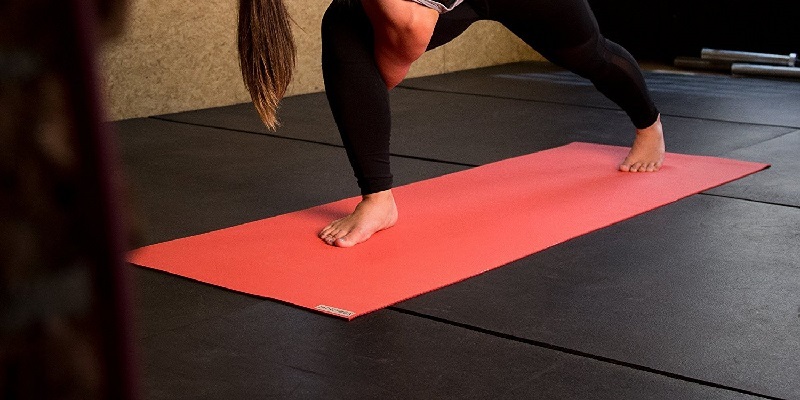 The stickiest yoga mat is the premium Clever LiquidBalance, but unless you have extremely sweaty hands, most of the other yoga mats will be good enough. Even the much cheaper Clever BetterGrip is okay for standard yoga. The exception is for hot yoga, where you sweat buckets. In this case, we advise you to get the stickiest mat or consider using a yoga towel. We take a look at the best yoga mat for hot yoga in this article. So which yoga mat should you buy? If you love to read yoga mat reviews and analyze which one you should buy, we’ve given you a lot of information to process. Some of you, though, just want to get started. That’s good too! In this case we have two simple recommendations. If money is no concern, check out the Clever Yoga LiquidBalance on Amazon by clicking here. For reference, our review is here. If you are on a budget, check out the Clever Yoga Better Grip on Amazon by clicking here. For reference, our review is here. That’s it, and good luck on your yoga journey. Later, you might look into more yoga bags, yoga towels, yoga wheels, or other accessories, but for now, a good yoga mat is all you need. Great site! I just started learning yoga and bought the clever yoga bettergrip like you suggested. If I get serious, those other prints look fabulous.